These mushroom cheese empanadas are made with a filling of baby portobello mushrooms, shallots, balsamic vinegar, raisins and fontina cheese. 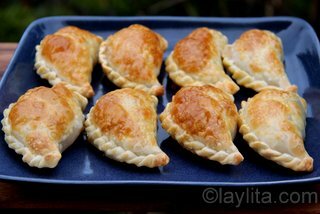 I used fontina cheese for this empanada recipe, it melts very well and also has a nice flavor that goes great with the mushrooms and shallots. 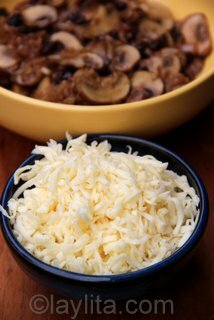 You can find fontina cheese at most grocery stores, but feel free to replace with any other cheese in case you can’t find it. 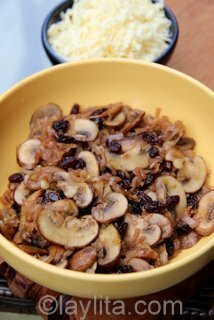 My kids were very skeptical of the addition of raisins to these mushroom cheese empanadas, but they work well with the shallots, mushrooms and balsamic vinegar. 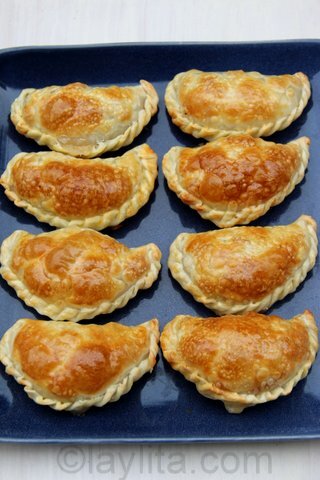 It goes without saying that you can always replace or omit any particular ingredient if you really dislike it, that’s one of the advantages of empanadas: you can always customize the filling to fit your personal taste. 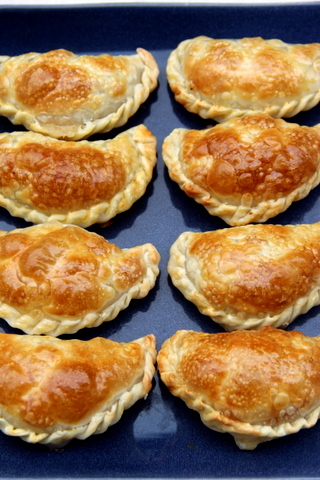 Though don’t give up immediately on some fillings, with empanadas sometimes the most unlikely combinations result in a great empanada. 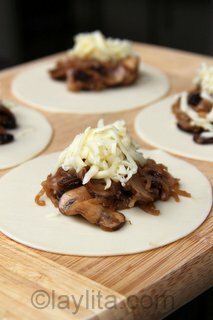 Mushroom cheese empanadas made with a filling of baby portobello mushrooms, shallots, balsamic vinegar, raisins and fontina cheese. 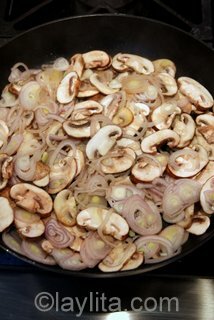 Melt the butter over medium heat, add the mushrooms and shallots and cook for about 15 minutes or until tender. 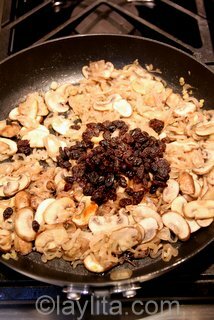 Add the raisins and balsamic vinegar. Cook for another 3 minutes and remove from heat, cool down. 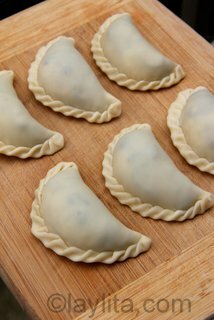 To assemble the empanadas, place a spoonful of the mushroom mixture and grated cheese on the center of the empanada discs. Brush the edges of the empanada discs with the egg whites, this is will help them seal better and keep the filling from leaking while baking . Fold the empanada discs and seal the edges, use a fork to help seal the empanadas, or use your fingers to twist and curl the edges creating a churito or curl type seal. Lightly brush the top of the empanadas with the egg yolk; this will give a nice golden glow when they bake. Pre-heat the oven to 400 F and bake for 15-20 minutes or until golden. 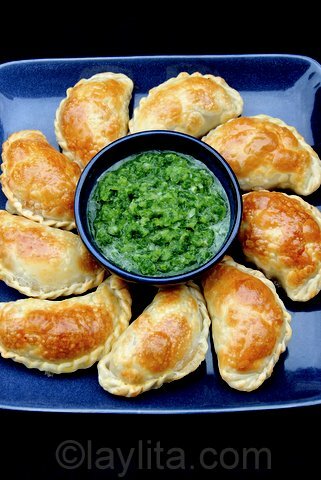 Empanadas make great appetizers. 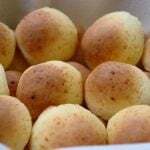 They can be made in advance and baked right before serving; the fillings can be customized easily based on your creativity and/or based on the leftovers you have in the fridge, and they look great. 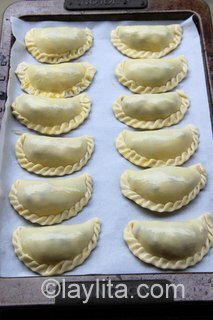 Empanadas are also easy to customize based on dietary preferences or restrictions, at dinner parties I usually make a couple of batches of empanadas and always have a vegetarian empanada option available. Also, on a cold rainy afternoon – which we have quite a few here in the Seattle area – there is nothing better than a nice cup of hot coffee and a warm empanada. 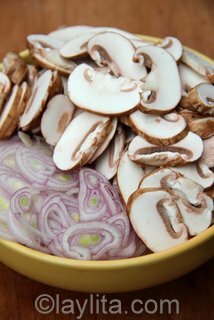 I always keep either the homemade discs or store bought one in the freezer so that I can make them quickly for afternoon snacks or for last-minute parties with friends. 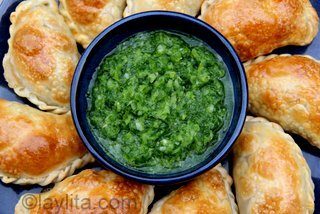 If I have time (and the ingredients) I like to serve empanadas with a dipping sauce. 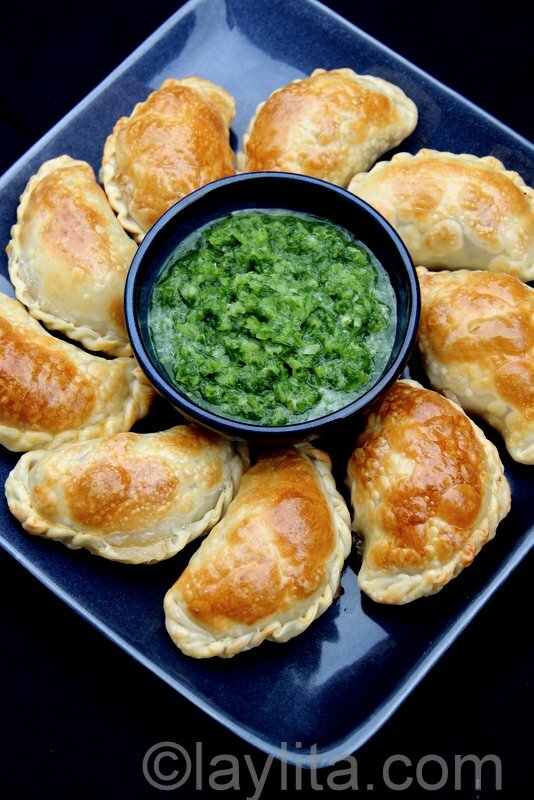 One of my favorite sauces, and the one I used for these mushroom cheese empanadas, is an aji criollo or a spicy cilantro sauce. 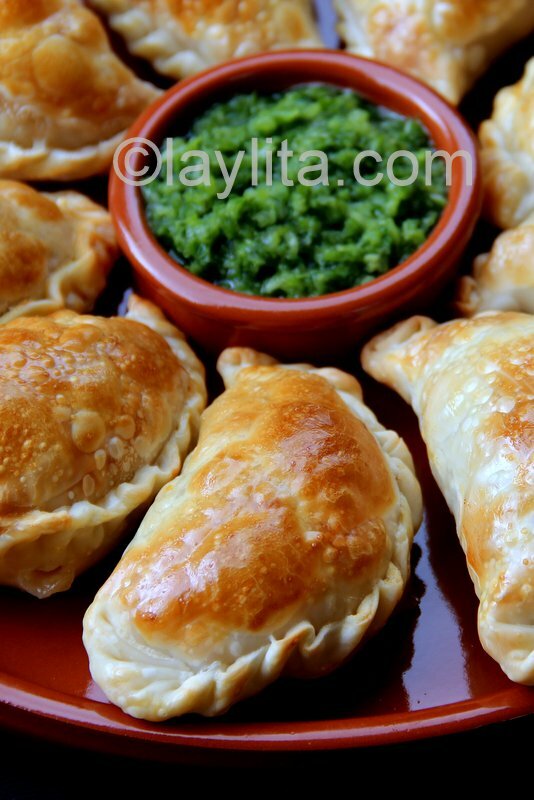 It’s really easy to make in the blender or food processor and adds a delicious touch of spiciness to the empanadas. They were really good. It worked very well for me because I´m vegetarian. 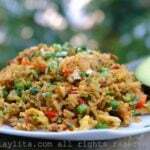 Every recipe is a delicious adventure in this website Laylita!!! Those are gorgeous! Mine have never turned out that pretty. Love it! Thanks to Noshon.it for leading me to you! Tried these today… they are really good! I saw these on tastespotting…They look incredible! Thanks for the recipe and great pictures. it’s a rainy day where i am, and i could definitely go for a couple of these… or 13 or 14 of these. It’s been a while since I last made empanadas, I’ll have to give these a try! Now these sound absolutely delicious! 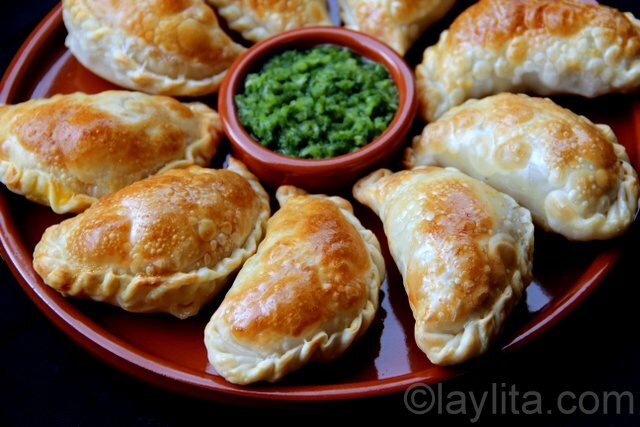 I have always been a big fan of empanadas, and these look astounding! My personal favorite might be carne asada with corn, peas, eggs, and chile peppers served with a chimmichurri sauce. Soooo good!